Hosting a brunch, whether for friends or to create a special occasion for family, is a lovely way to spend a weekend morning. 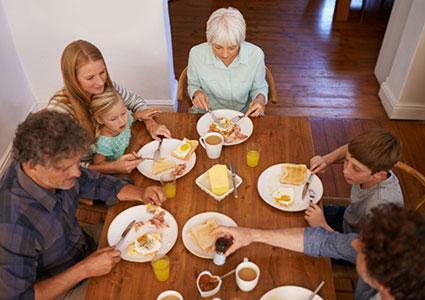 With the right recipes and a little planning, you can have a delicious brunch to share with loved ones. 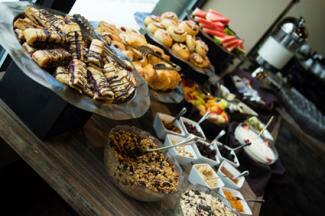 For a large crowd, a brunch buffet might be just the ticket. For a buffet, you need recipes that cook quickly and keep well, so people can work their way through the buffet whenever they'd like. Choose any, or all, of the following recipes, which hold up well on the buffet table, especially if you have chafing dishes. You have several choices in eggs, depending on whether you wish to make them ahead of time or make them to order. 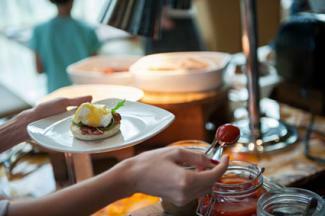 Choose one or two egg dishes for your brunch buffet. Include a Hollandaise sauce for guests who want to create an eggs benedict dish or just add a little punch to their scrambled eggs. Scrambled eggs are your best bet for a buffet style brunch. You can cook up a large batch and keep them warm in a chafing dish. You can also cook them to order, if you wish. Toss in a handful of chopped, fresh chives to give the dish a little bit of color and extra flavor. Pancetta frittata is a delightful twist on basic bacon and eggs. You can make several servings at once, and it comes together quickly. The pancetta has a subtler flavor than bacon while still imparting a savory deliciousness to the eggs. Get a little fancy with pickled quail eggs, which add a pop of color and a tangy flavor to your brunch. These hardboiled eggs are not only cute, but they're tasty and they keep well. A breakfast casserole is a good make-ahead idea that can serve a crowd and sit out for a while as people serve themselves. What's a classic brunch buffet without a selection of breakfast meat? Consider these as a part of your next breakfast buffet. Choose one or two meats for your buffet. Bacon is the classic breakfast meat, and you can cook a large batch in the oven and keep it warm until it's time for brunch. Breakfast sausages cook quickly and easily in the oven or stovetop, or you can make your own, including ground turkey breakfast sausage. Baked ham is another great brunch meat, and it's easy to warm up, slice, and set out. If you don't want to make your own ham, you can also buy a selection of deli cold cut meats including ham. Set out an assortment of fruit, such as sliced melon, berries, grapes, pineapples, and bananas. Potatoes are a breakfast standby. Try one of the following casseroles for your buffet. Hash brown potato casserole is a creamy mix of potatoes, mushroom soup, and cheese. Breakfast hash brown casserole has eggs, hash browns, and sausage in a single casserole. Applesauce and banana whole wheat muffins are a healthy, low-sugar, whole-grain muffin that are easy to make ahead of time. Sweet potato muffins are a spicy and tasty brunch muffin. Banana bread is a brunch classic with a wonderful banana flavor. Biscuits are flaky and easy to make. They are perfect for making sandwiches with the eggs and breakfast meats. Another great way to have a brunch is to make crepes with multiple fillings available. You can make the crepes themselves ahead of time and offer an array of both savory and sweet fillings, so your guests have several different options. Eggs benedict crepes have all of the delicious flavors of eggs benedict -- poached eggs, hollandaise, and Canadian bacon. Have pulled pork, tangy with barbecue sauce, as a savory crepe filling. Smoked salmon with cream cheese or sour cream and chopped capers or chives makes a tasty savory crepe filling. 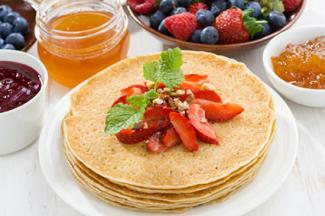 Sweet crepe fillings can be as simple as sliced berries or tasty jams, or they can be a bit fancier. Try crepes Suzette, a flambéed crepe with an orange sauce. Fill your crepes with bananas foster, made from caramelized bananas, rum, and spices. Leave out the ice cream, and instead top with a dollop of whipped cream. Slice your favorite fruit and top the crepes with homemade whipped cream. Crepes seem kind of fancy, so you may want your beverages to be a bit fancy, as well. Mimosas are a simple cocktail of orange juice and Champagne that are perfect for brunch. Champagne is a great accompaniment to crepes. Place sparkling grape or apple juice out for non-drinkers and guests under 21. Sometimes, simple is best. Having a pastry, donuts, and fruit brunch allows you to prepare everything ahead of time, and then sit and enjoy the brunch when it's time to serve. For fruits, select an assortment of sliced fruits, berries, and melons, or, save yourself some time and purchase a pre-cut fruit platter. Consider offering a fruit salad, such as ambrosia salad or mixed fruit cocktail, which can be made ahead of time and chilled until it's time to serve. Lay out a few different selections of the following pastries. Bear claws are flaky pastries with a sweet almond/cinnamon filling and a delicious glaze. Cinnamon rolls are always a fragrant and delicious favorite. For something a little different, try red velvet cinnamon rolls, which have a tasty twist on the classic. Danish pastry is flakey and delicious without being overly sweet. Apples in pastry combines fruit and pastry in the same tasty dish. Apple fritters are a classic breakfast donut with sweet apples and cinnamon. Make simple, delicious, classic homemade donuts that make your house smell great as they cook. Have some rich and tasty chocolate krullers, with a tender interior and a great cocoa flavor. Aside from milk and coffee, which both go great with fruit and pastries, try some hot chocolate or hot spiced apple cider with this brunch. For a boozier brunch, offer Irish coffee. There's no need to go out to a restaurant when you want to have brunch. Whether simple or fancy, a buffet or a served meal, brunch is a great way to spend a lazy Sunday morning connecting with friends and family.